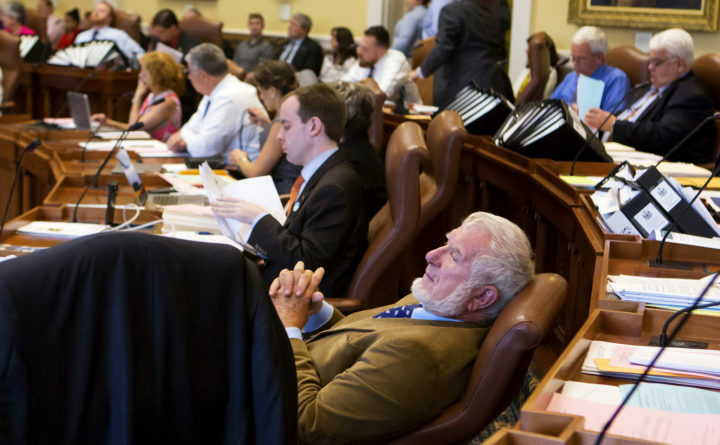 Sen. Dave Woodsome (right), R-North Waterboro, leans back in his chair while listening to arguments during the Senate's hearing on the state budget at the Maine State House in Augusta in June. Though there were some items of agreement Thursday when the Maine Legislature’s 10 leaders plowed through hundreds of votes on new bills to consider in 2018, the meeting was what we’ve come to expect in an era of split majorities and divided politics. Only a fraction of the 272 bills submitted by lawmakers for the second year of the 128th Legislature made it through, but there were relatively few bipartisan votes. The majority of the bills that failed did so in 5-5 votes, with all the Republicans on one side and the Democrats on the other. Though a truth about Augusta is that there are many bills that receive bipartisan support — not a single bill could pass without it, considering Democrats hold the majority in the House and Republicans hold the Senate — on many of the biggest issues the Legislature is cleanly divided. That will only deepen in 2018 as lawmakers deliberate a smaller and more focused crop of proposals against a backdrop of the November elections. There doesn’t appear to be much of an appetite to rehash old fights from the first session. Lawmakers tried to extend many of this year’s debates on items such as the state’s bottle redemption system, female genital mutilation, limiting gubernatorial power and what could be considered a growing gorilla in the room: Maine’s citizen-initiated referendum process. Despite lawmakers of all stripes saying often and loudly that the process of putting a question on the statewide ballot is too easy, it’s not an issue the current Legislature appears willing or politically able to tackle. Many of the bill titles that made it through are sort of ho-hum. There will be some substantive debates in 2018 on issues such as changes to the criminal code and attempts to spur job creation, but many of the newly minted bills are about technical adjustments, housekeeping and constituent services. The second year of a legislative session is supposed to be reserved for emergencies and budget bills, but among the “emergency” proposals approved Thursday will be work on items such as naming a wildlife management area and changing utility district charters. Dissent about Thursday’s decisions is already building, but may fall on deaf ears. A number of lawmakers have already complained about some of the Legislative Council’s decisions and said they plan to file appeals, which will be considered on Nov. 3. Senate Minority Leader Troy Jackson, D-Allagash wants a second chance at implementing a “hire American” tax credit; Sen. Justin Chenette, D-Saco, wants to work on ethics rules for political action committees; and Rep. Stephen Stanley, D-Medway, is intent on continued funding for a gynecology unit in Calais. Appeals of rejected bill proposals have rarely succeeded in the past. Will 2018 be a busy year at the State House or marked by busywork? In addition to the bills accepted Thursday, there are 319 other bills that were carried over this year. That’s a big number. Only 131 bills were carried over in 2011, 207 in 2013 and 176 in 2015. There are also a number of bills from state agencies and there is little question that Gov. Paul LePage, who can make proposals any time the Legislature is in session, will continue to shake up Maine politics as he nears the end of his final term in office. Our prediction? The 128th Legislature will adjourn knee-deep amid the husks of policy proposals and good intentions.